If you haven’t heard of a Scamp sailboat, please check out the SCA Scamp site. My thoughts regarding this competent little boat are found here. What will I change for this second build? Check it out here. You can read my spar wood musing here. You can read my voyaging design thoughts here. Finally, you can find my hatch musings here. With these concepts in mind, let’s build a sailboat. Boredom is a terrible thing. So, I’ve decided to build a Camper Van. For those who might be interested, I’ve included the link to this next adventure here. What a great way to haul around my Scamp sailboat. I happen to have a small lake located 1/2 mile from my home. Tonight after work, the wind looked good so I took Hagoth on a date. I absolutely love the floor grate. In the up position, effectively leveling up the floor, it makes working on the rig a safe and easy process. I remove and install all sail and spar covers directly from the cockpit. The captive cleat worked marvelous. It freed up one hand for other tasks. Trailering with the sail and spars in full cover bags secured to the side of Scamp works perfectly. The forward strap runs through the forward deck cleat. Make sure you buy 6″ cleats, you’ll need the room. The aft cleat is secured through the aft cleat. The sail and spars don’t budge. Let’s go through each of these issues one at a time. It works best when you don’t forget to secure the CB in the up position, especially on a concrete ramp. This was quite a circus. Once I got the CB raised, the boat took off downwind, forcing me to jump aboard. This left my car at the ramp with the trailer half submersed. (Sun bathers now raising an eyebrow) I found myself wildly swinging between both tacks with a half filed ballast tank and a fowled mainsheet. After several wildly out of control near mishaps, I sailed back up wind, running aground on the sandy beach, where I could secure the boat while I parked the car. Hmm. Let’s be smart about this. This time, I jumped aboard while pushing off and immediately dropped my anchor in 3 feet of water and played out 20′ of line. This was instantly like hitting the pause button. I was now totally secure in 5′ of water looking over the rig in a calm controlled fashion (sun bathers now taking another sip of their beer) Thank goodness for anchors, I’ll never day sail again without one. Once I had fine tuned things a bit, I weighed anchor and let the boat drift off shore before dropping the CB and sailing away. I then commenced sailing for several hours before coming back to shore. I love having 2 bow lines secured at all times. These lines gave me control over the boat when launching off the trailers. Make sure your CB is secured in the up position before launching. The anchor allowed me to board the boat and drift into deeper water, which helped fill the ballast tank. It then held me securely while I topped off the ballast tank with more water. I loved having the anchor rigged and on the ready. This saved me much frustration. Also, the retrieval line system worked like a champ. I will always sail with an anchor. It saved me a lot of frustration. It was so nice to have it rigged and ready. Otherwise, it would have been futile. The retrieval line system worked as advertised. The Home Depot tool bag made line stowage a cinch. I never really felt like I knew how to park Scamp prior to tonight. Here’s what I learned. You first need to stall the boat into the wind to burn off hull speed. You then fall off the wind so that the boom is coming across the cockpit on a 45 degree angle. Now, throw the tiller leeward. This will literally stop the boat, effectively parking on the water. This was such a marvelous experience that I just stopped everything and observed what was going on for several minutes. As the boat falls off the wind and attempts to gain speed toward leeward, the tiller anchor the hull and forces the nose to point back into the wind. This causes the boat to loose energy and stall. This in effect causes the nose to fall again leeward, repeating the process all over again. This is such an amazing thing to observe. I was totally mesmerized watching the boat go through these repeating steps while I did nothing but watch and predict her motions. If you have never done this maneuver, you must go learn it, practice it and own it. It’s just amazing to see and feel these physics in action. I will continue to practice this maneuver over and over. It’s an amazing trick to have in your tool bag. I truly believe I could cook a hot meal while in the stalled state. I never knew prior to tonight how to pause sailing to this level. It’s truly a remarkable maneuver. This is one of the reasons why I have settled on a Scamp sailboat. Cuz, my wife and kids are often busy and uninterested in sailing. If I had a larger boat that was difficult to handle, I wouldn’t have gone sailing tonight. But, with Scamp it was no big deal. I hooked up by myself, launched by myself, sailed by myself and retrieved by myself. There is something very satisfying about going through these procedures by yourself. It builds your confidence and increases your competency. Part way through my sail, I became aware of the excessive amount of force needed to keep the boat on my desired point of sail. This was so simple to correct. I brought Hagoth into the wind, dumping the pressure off the canvas, dropped the sail, readjusted the pick points on the boom and yard, hoisted the sail and sailed away. Like magic, the excessive pressure was gone. More sail in front of the mast decreases weather helm. Simple, quick, easy and effective. I’m learning to love the balanced lug rig. I fell in love with my scamp tonight. I sailed for just over 3 hours and learned so much. Yet, there is so much to continue learning with this boat. I love the size, the stability, the rig, the simplified rigging lines, the anchoring capability….the list goes on and on. So glad I built another one!!!!!!! It all happened today. This morning at 10:30 am, Hagoth officially launched into light 5-8 mph winds off the coast of Rigby Idaho. Knowing that we don’t drink, my most excellent neighbor brought us a bottle of Martinelli’s Sparkling Apple-Cranberry juice. Everybody has helped with the project in some form or another. Here she is, wet for the first time, just waiting patiently for the skipper. Bennett getting his first tacks aboard Hagoth. You gotta love that hair. Teenagers are awesome. I wish I still had that much hair. First Mate taking a turn. #433 moving for the first time in light winds. She officially goes from kit to finished boat. And, she handled beautifully. It’s been a heck of a run guys. I’m very happy to be done with this project. I feel like I’ve accomplished a lot with this build. There were so many changes I wanted to make, so many small but important tweeks to get the boat and rig the way I wanted. I’m tired, but I’m happy and very satisfied. Now, I just want to go sail and get to know her. I’m now very close to launch. But, there still remains a myriad of task to work through prior to sailing. First off, I don’t run reefing lines through the sail grommets and back to the boom. This creates too much line for my liking. Instead, I secure the reefing lines directly to the sail grommets. Once the line reaches the boom, it runs through a check block and back through an eye to secure the tail. I then tie a grab loop into the end of the reefing line. Blue line for 1st reef, red line for the 3rd reef. I skip the 2nd reef to keep the spaghetti to a minimum. Notice the lazy jack thumb cleat. This keeps the lazy jack from migrating fore on the boom. Gotta love lazy jacks. Once understood, you’ll never leave home without them. Forward two reefing lines. All reefing lines tie off at respective cleats located near the middle of the boom. Halyard and downhaul with accompanying rigging. The elevated cleat block is very easy to use. Halyard attachment point to the yard. Lazy Jack are essential sailing tools. Learn how they work and you’ll love them. Never figure them out and you’ll hate them. I opted for 4 legs to my lazy jacks, 2 up front and 2 behind. The jacks are tied off at the top of the mast to prevent the jacks from pulling through the pad eyes. They travel down and wrap around the boom/sail bundle and clip back onto each other. I use a small brass ring and fastener to accomplish this. The jacks are sorted and attached prior to raising the sail and make handling your sail much easier. Don’t be intimidated by them, there worth the hassle. Now when I drop my yard, it all comes down in a single plane and stacks right on top of the sail. Boom baby!! Anchor lines need to be run and on the ready in order to be of full benefit. Things happen way too fast for last minute rigging and deploying. With this in mind, I wanted a simple yet effective way to store, deploy and retrieve my anchors. Howard Rice has described a technic for running the anchor lines that I will follow. Please search the SCA Scamp Forum for the full detailed description, there are several diagrams showing the process. This post may be hard to understand without a basic understanding of the lines and how there run. I secured the chain to the rope using a simple utility locking biner. And a stainless shackle to secure the chain to the anchor. I’ve rigged my main anchor off the starboard side of Scamp. One side is for the main anchor, while the other side is for the sea anchor. Notice the retrieval rings and retrieval lines. These lines bring the anchor lines back to the cockpit for easy retrieval. Otherwise, you’r walking to the bow, which on Scamp can be problematic. I may swap these lines out for a different color for faster identification in the future. The main anchor line comes back into a Home Depot tool bag, where the bitter end of the line is secured. Notice the bag is strapped down in the event I capsize. The sea anchor is secured using a swivel and biner. The sea anchor is secured under the port side coaming in the cockpit. And, the sea anchor line is flaked into another tool bag, where the bitter end is secured. I love the twin tool bags and the open lazarette. You can throw a lot of stuff into the lazarette. I now need to deploy the anchors and see how the entire system works in the real world. On my last Scamp, I had to bend down on my hands and knees to effectuate the center board. This was always an issue, especially in shallow water when you wanted to be standing up watching where you are coming into the shore. Derek Gries, from the Scamp forum, suggested I rethink this arrangement and do as he has done. Notice the convenience of this setup. Derek can reach his CB line when standing or siting. This is a big improvement over the stock setup in my estimation. After thinking about it for like 5 seconds, I decided Derek had the right idea. First off, the CB safety line. When your boat turtles and the CB retracts, you’ll need a way to retrieve it. I elected to add a tail to my center board by utilizing a pad eye. The stainless screws are well imbedded in epoxy. This 3/16″ line is 3 feet long. I want plenty of length so it won’t retract into the CB case. The bright fleck keeps the line visible. And, yes the CB still fits in the CB case. Now for an overall look at the modified CB rigging. The fore end of the rigging. Notice the line has jumped the block…easy fix. The aft end of the rigging. I used a pad eye to keep the line close to the cleat. Bennett ran all the rigging lines and tied all the knots. We then learned we could tie a grab handle in the bitter end of the line. This provides two distinct advantages: 1-provides a stop knot for the CB in the down position, and 2-provides a quick grab handle when reaching down to retrieve board. These small yet significant alterations make the overall process safer, cleaner, simpler and more enjoyable. A organized sailor is a relaxed sailor. A hearty thanks to Derek for this most excellent idea. On my last build, I used cleats to secure the uphaul/downhaul rudder lines. They were slow to cleat off and clumsy when I was in a hurry (which was always). I wanted a faster cleaner system to deploy and actuate the rudder in both the up and down position. I first needed to install my rudder downhaul line into the rudder. I did this using a figure 8 knot. I ran my control lines through the same opening as the tiller arm. When I built the rudder head, I rounded the upper portion to allow for a smooth entry of the lines. Also notice, when I pinned my tiller arm, I kept it up near the top of this opening to allow room for the lines to run into the cockpit unimpeded. Showing how I rounded the rudder head filler boards for the lines. I used a simple knot to secure the uphaul line to the rudder. I used a square bail bolt to secure the tiller arm to the rudder head. This makes it impossible to loose the bail from the bolt. To make it easier to remove the bail, I attached a loop line to the end. By pulling this line, the bail immediately pops off. I also secured the bolt to my stern eye to prevent me from dropping it. This photo shows the entire line control system at a glance. The rudder is in the up position. Now let’s run through the parts. This hook secures the uphaul line when the rudder is in the up position. By. pulling against the knot, the line comes forward, raising the rudder. You can then easily drop the loop over the hook. The pad eye tends the uphaul line when the rudder is in the down position. The blue line is the rudder downhaul line. In this photo, the rudder is in the down position and the blue line has been pulled taught. Notice, I’ve decided to use this hole in my tiller for the rudder downhaul line as opposed to shortening the tiller arm. 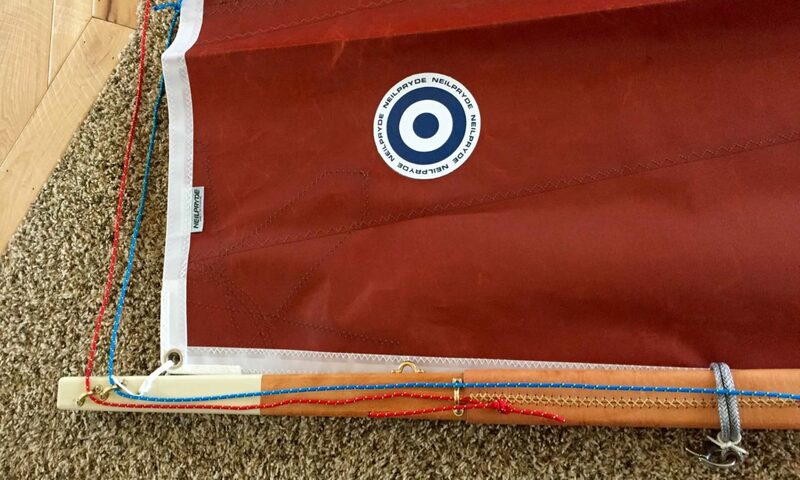 By looping this blue line through the tiller arm, it provides enough resistance to keep the rudder in the down position. If I run aground, the blue line easily pulls through this hole to release the rudder. In essence, this hole acts as a break-away cleat (which I’ve never cared for). CB uphaul line and controls. It’s always a challenge to transport sailboats. You’ve got the rudder handing off the back, mast, boom, yard and sail with which to contend. There’s boom gallows and elaborate ways of utilizing the gudgeons. There’s straps and boat covers that get in the way. And, then there’s the vibrations from the road taking a toll on your gear. Idaho is farm country, we hog tie just about everything. Hagoth has been hog tied to the flat bed. The bow line keeps the boat from moving backwards. The flat bed cleats keep the boat from rotating or moving sideways. I then added an eye bolt to the fender step. The diagonal strap keeps the boat from moving forwards. The aft strap keeps the stern from raising and prevents the boat from rocking. All straps clear the hull and don’t rub the paint as I travel down the road. The boat is rock solid and doesn’t shift a bit at highway speeds and bumps. The torsion axel keeps the ride soft and springy. Have you hog tied your boat today? The oarlock and fenders keep the bundles from toppling off. At this point, I let go of my original plan and simple tied everything in place. I tied both bundles at 3 secure points: 1-aft cleat, 2-oarlock and 3-fore cleat. I then tied 2 additional ties around both ends to minimize fabric movement. The bundle is extremely solid, tucked into the boat and out of the way. The mast sticks 3 feet past the transom. I love things simple. Sailing cannot get too simple. Anytime you can remove parts and have fewer things to touch, your life gets better as a sailor. I’m very pleased with this ultra simple approach to what seems to be a rather complicated issue of how to carry your mast, boom, yard and sail. I had the distinct pleasure of loading Hagoth on the flat bed trailer. It looks awesome. I then began thinking how to secure the boat on the trailer. I felt some form of deck cleating to guide the boat onto the trailer and to keep the boat from drifting side to side would be advantageous. The cleats were set just outboard of the bottom skegs. I cut the inside edge off the 2 x 6 to help center the boat. but it became obvious that I needed to further round over the 45 degree cut to help center the boat when loading. By placing the cleats on the outward edge of the skegs, there’s plenty of room for the nose to find its way onto the trailer. This will keep Hagoth off the wheel wells when traveling to my sailing destination. And, the cleat doesn’t interfere with or touch the hull. I’ll now focus my attention on strapping the boat to the trailer without scratching the paint job. I decided on a flat bed trailer some time ago. The flat bed allows for easy access to your boat, as you can walk around the perimeter loading gear. They also allows good access to the bow eye and deck cleats. This comes in handy when loading and unloading the boat off the ramp. As I went looking for the perfect fit, I realized it didn’t exist. But, the basic drift boat trailer came very close to offering most of what I wanted. I did say, almost perfect. I’m adding 2 x 6 to a Hyde drift boat trailer to create a basic flat bed. The aft roller is made of rubber for a smooth on/off loading. To reduce flex, I added a 2 x 6 under the mid section and screwed down into it. This really stiffened up the bed. Once complete I rubbed the decking with boiled linseed oil. I chose this over carpet for ease of assembly, ease of re-applying and less drag coefficient. The boat should slide right on and off. The wood also allows for quicker drying compared to carpet. I’m on the homeward stretch and I can feel it. I’m now giving this project everything I’ve got to get it done. I really want to quit building and go sailing. Outriggers for the trailer to hold my mast, boom and yard.